To Cite: Maghsoudi M, Shahbazzadegan B, Pezeshki A. Asymptomatic Intracranial Foreign Body: An Incidental Finding on Radiography, Trauma Mon. 2016 ; 21(2):e22206. doi: 10.5812/traumamon.22206. Introduction: Intracranial needles are rare entities. Intracranial foreign bodies due to non-missile intracranial penetrations are one of the most rarely encountered situations in neurosurgery. Sewing needles are among the more unusual foreign bodies that may be found in the brain. Although uncommon, foreign body cases are important and interesting. Foreign bodies enter the body through trauma or iatrogenic injuries. Needles are mostly inserted through fontanelles, cranial sutures, and more rarely through the orbits in infancy for the purpose of killing unwanted babies. Case Presentation: This article presents a case of intracranial foreign body found upon radiography. A 24-year-old female, who two days prior to presentation suffered only once from dizziness, and was otherwise healthy. Conclusions: Because this incident may have occurred during the patient’s neonatal period, it may be a case of child abuse. In spite of the very limited number of cases in the literature, having a stepmother, a stepfather, or a babysitter, being the youngest child, or having family members who suffer from psychiatric disorders, (especially if these relatives are responsible for child care), living in a society that allows homicide of children born from extramarital relationships, and being female have been suggested as possible risk factors. Intracranial foreign bodies due to non-missile intracranial penetrations are one of the most rarely encountered situations in neurosurgery. Most of these penetrating injuries result from industrial accidents, criminal assaults, or self-inflicted wounds. Several foreign bodies penetrating the cranium such as knives, nails, pencils, and wood pieces have been described in the literature (1). Intracranial foreign bodies are generally due to penetrating injuries through the orbits, ears, or cranial bones. Sometimes surgical objects may be forgotten in the brain during surgery. Patients with intracranial needles have rarely been reported (2). Although uncommon, foreign body cases are important and interesting. Foreign bodies enter the body through trauma or iatrogenic injuries. Because of the thin nature of the bony orbital skeleton, intracranial pencil injuries are often transorbital (3, 4). In 2013, Deveer et al. 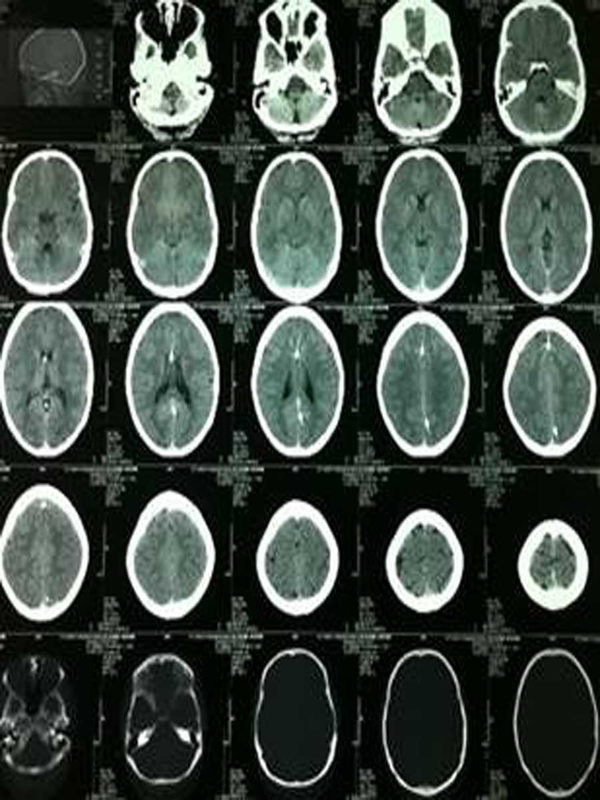 presented a case of intracranial foreign body identified by a CT scan obtained from a patient with presyncope after over-exertion (4). Needles are usually inserted through fontanelles or cranial sutures, and more rarely through the orbits in infancy for the purpose of killing unwanted babies (5). This kind of incident may have been due to another child poking a baby with a couple of needles, or the child could have done it himself and not remember the event as an adult (6). This report presents a case of intracranial foreign body. The patient was a 24-year-old female who suffered only once from dizziness two days prior to presentation and was otherwise healthy. 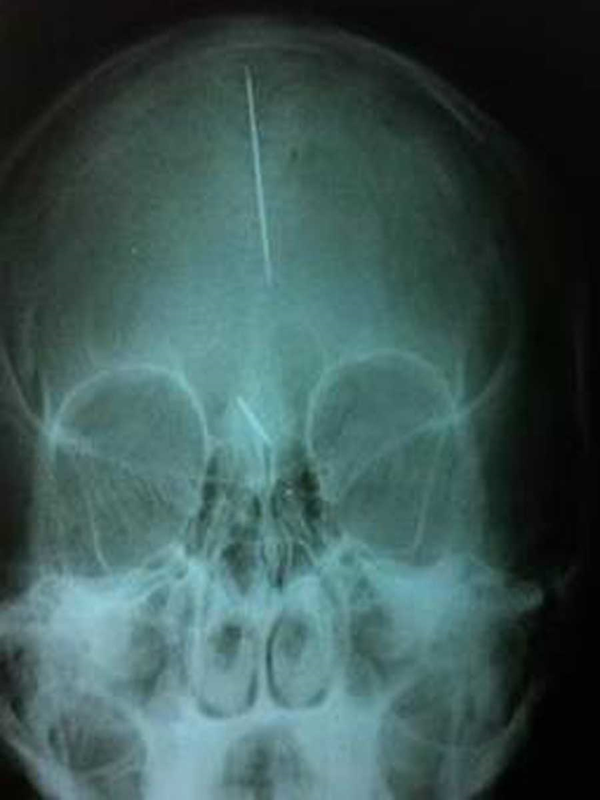 The radiological findings in our patient demonstrated that the intracranial foreign bodies resembled sewing needles. The locations of these objects suggest that the intracranial needles may have been inserted through the fontanelles during infancy before the closure of the. cranial sutures. The radiological findings in this patient strongly suggest that two needles were introduced into the brain. Two long foreign bodies (needles) with regular borders and sharp tips can be seen on the radiograph (Figures 1 - 3). A CT scan was also performed. The patient informed us that she was not aware of the foreign bodies. No areas of intracranial hematoma or encephalomalacia were seen. The asymptomatic nature of the foreign body may be due to the body’s typically high tolerance for needle-like objects. 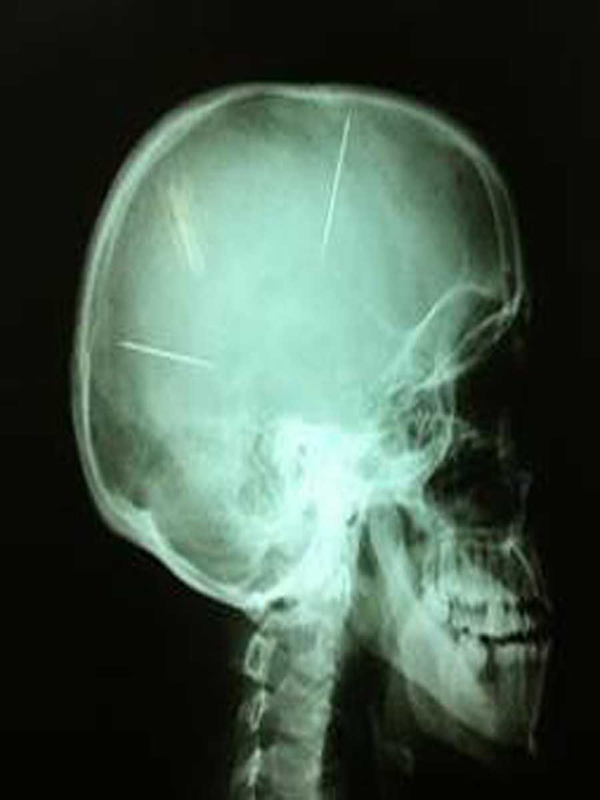 Placing sewing needles in the brain through the anterior fontanelle was first reported in Germany in 1914 (7). Penetrating objects are a common cause of intracranial injury. However, penetrating cranio-cerebral injuries due to objects such as needles, iron rods, pieces of wood, or nails are rare (8). Sewing needles are among the more unusual foreign bodies that may be found in the brain. They may end up in the brain as a result of enmity, assault, or accidental injuries. Although the incidents often occur in infancy or early childhood (before the closure of the fontanelle) they may not present until much later in life with features of headache, seizures, or altered behavior (9). Amirjamshidi et al. suggested that this is a type of battered child syndrome, which may be traditional and prevalent in some communities (10). Most of the intracranial sewing needles that have been reported seem to have been introduced in infancy before the closure of the fontanelle, and these patients were often diagnosed in adulthood (11, 12). 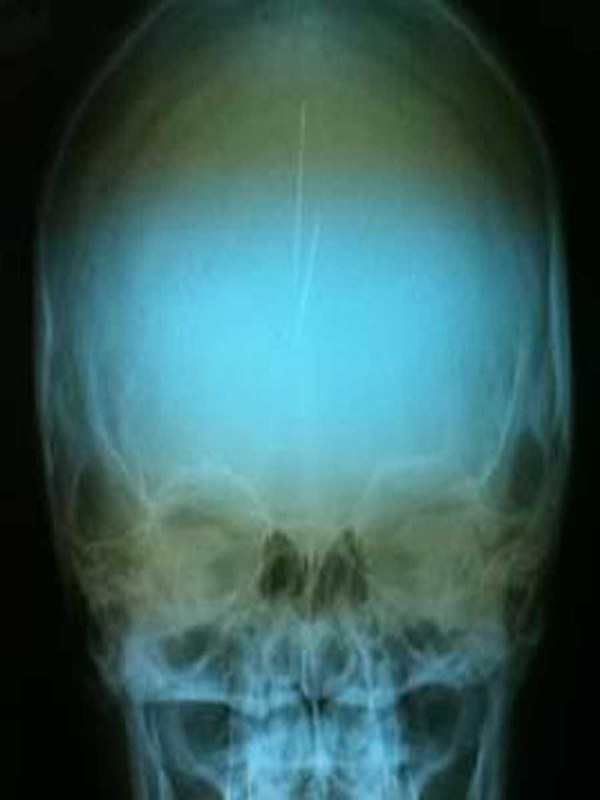 Intracranial sewing needles have been reported previously (12). There are many reports of sewing needles and other foreign objects retained in the brain for long periods of time without symptoms (2, 11). Yurekli et al. reported that patients with intracranial needles may present late in life with epilepsy or status epilepticus. They suggest that surgical intervention is unnecessary if seizures are under control with antiepileptic drug therapy (13). In spite of the very limited number of cases in the literature, having a stepmother or father, a babysitter, being the youngest child, having family members with psychiatric disorders (especially if said family members are responsible for child care), living in a society that allows homicide of children born from extramarital relationships, and being female have been suggested as possible risk factors (2). Although cases of intracranial sewing needles are uncommon in the literature, this may be due to the low associated survival rate. Surviving cases are usually diagnosed by skull radiography after minor head injury (11). Because this incident may have occurred during the neonatal period, it may be a result of child abuse. We would like to express our special thanks to all the Fatemi hospital personnel for their help and support. Authors’ Contribution: Mohammadreza Maghsoudi and Arastoo Pezeshki developed the original idea and the protocol. Bita Shahbazzadegan wrote the manuscript, abstracted data, and prepared the manuscript.